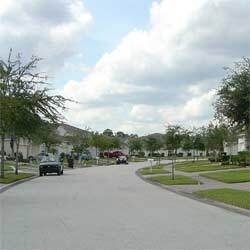 Cumbrian Lakes is located in the bustling city of Kissimmee located almost dead center in the state of Florida. Over the past decade the Central Florida area has seen a massive and promising expansion with its surprising economic boom. The area continues to grow in population and economy, with all the people moving in a large amount of new communities and neighborhoods have sprouted over the past few years, Cumbrian Lakes being one of them. With vacation homes, town homes and long term homes opening up on the market it can be tedious work to find a neighborhood or community you are comfortable with. However, lucky for you, we know the area like the back of our hand, and we can tell you all the great reasons that the Cumbrian Lakes Community is a viable choice for your visit, or permanent residence. 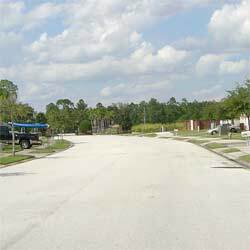 Cumbrian Lakes was built just a short distance from the primary route of transportation in the Kissimmee area, U.S. 192. Cumbrian is just a short drive away from the center of town, in fact if you enjoy walking you can get there by foot. Cumbrian is just far enough back from the road that you can’t hear the traffic or get in the hustle and bustle of the city life. However, it is just close enough that you can get all your daily amenities such from stores such as Wal-Mart, Home Depot and a wide variety of grocery stores. 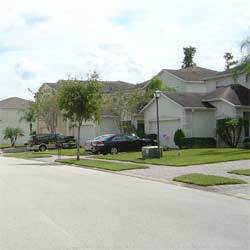 If you’re looking for a vacation home in the surrounding area you probably already know that Central Florida is abundant in attractions and entertainment. Just a few years ago the Orlando area was officially the “Number one destination for vacations in the entire world.” The Central Florida area met its biggest and most beneficial challenge in 1965 when Walt Disney announced that he would be opening the now famous Walt Disney World Resort in Orlando. The economic boom the area experience after the park opened has made the area the lively location it is today. Cumbrian Lakes is located just nine miles from the entrance to the Walt Disney World Resort, just another added benefit to staying or living in this great neighborhood. The Walt Disney World Resort is home to four separate theme parks and two water parks. The theme parks are: Magic Kingdom, Hollywood Studios, Epcot and Animal Kingdom and the two water parks are Typhoon Lagoon and Blizzard beach. Just a short distance further you can find Orlando’s Universal Studios and Islands of Adventure, joined together by the popular City Walk. Another great park in the Central Florida area is Sea World, where sea life meets entertainment! Right next door to Sea World you can find Discovery cove where you can swim with dolphins! Because Kissimmee is located so close to the Orlando area you can find a wide variety of local attractions, entertainment and shopping! Kissimmee has access to one of the largest lakes in Central Florida, Lake Tohopekaliga. Here you can get airboat rides and see Florida’s animal life in their natural habitats. Or you can go see Florida’s Animals at Gatorland; a fun adventure that lets you get up close encounters with alligators, even feed them! One of the best places to shop in Central Florida is Old Town, on the edge of Kissimmee and Orlando. Here you can find a wide variety of small little shops with all sorts of interesting souvenirs and local arts and crafts. Old Town is widely known for its events and car shows that are hosted all throughout the year! From the moment you pass the towering Cumbrian Lakes sign surrounded by an impressive water fountain you will quickly realize that this is no ordinary neighborhood. The long palm tree lined entrance and secured gate just add to the expectations for this beautiful neighborhood. As you drive through you will quickly realize all the lakes inside the development. Nearly half the homes in the community have their backs to water. That means as your browsing through these estates you will find a wide variety of lakefront properties. Wouldn’t it be great to wake up every morning and have the choice to fish off your back yard? People who lived in this area before the Cumbrian Lakes Community came to life will tell you these waters were fished on regular bases, and are just teaming with fish. Something that stands out about the neighborhood is the intricate design of the side walks and pathways. Instead of solid concrete slabs these pathways are paved with bricks in the most beautiful of designs. The reason for this is because the entire development is great for exercising and leisurely walking. Around a remote lake there is a full pathway as well as crossing wooden bridge, a beautiful place for any late or early day walk. Every home in this large community has its own screened in porch as well as full sized pool. This means you can wake up every morning and relax in your lanai with the beautiful view of the lake or lakes. The pool is a great way to cool off during the hot summer days in Florida. 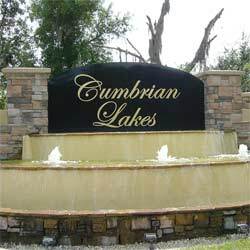 So if you’re looking for a home or vacation home in the Central Florida area be sure to check for listings inside Cumbrian Lakes. With such great properties and such a great development these homes will fly off the market fast.